Up until the finding of the wreck of the RMS Titanic, most people believed the great ship sank where her 4th officer Joseph Boxhall said she did. However there were those who did not swallow the evidence given at the time. Prominent among the “Doubting Thomas-es” were the captains of the steam ships Mount Temple and California. Both these men expressed publicly that they believed the distress position sent out by Titanic was incorrect and that the ship had foundered a number of miles to the eastward. Their concerns were totally ignored. Until he passed away at the ripe old age of 83, Titanic's 4th Officer Joseph Boxhall never expressed any doubt whatsoever as to the accuracy of the distress position he had calculated. His conviction as to the accuracy of his own work was so positive that one of his last wishes was that when he died, he was to be cremated and his ashes were to be scattered over the exact distress position he had created. Boxhall died 55 years and 10 days after Titanic sank, and his wishes regarding the scattering of his ashes were carried out to the letter. In 1985, eighteen years after the mortal remains of Joseph Boxhall were committed to the deep, the wreck of Titanic was discovered. Then, the doubts of the captains of the Californian and the Mount Temple were proved to be well founded, because Titanic's remains were found on the sea bed almost thirteen miles to the eastward of where everyone, including Boxhall thought they should have been. Perhaps, much like the crew of the Flying Dutchman, Boxhall's mortal remains were doomed to circulate the North Atlantic until the end of time? Since that day when the remains of Titanic were found in the “wrong” place a great deal of scholarly navel (not naval) contemplating has gone into attempting to solve the puzzle of this apparently glaring error in basic navigation. More to the point, how could those who were responsible for the safe navigation of the ship have made such a fundamental mistake and fail to discover it? It was already known from the transcripts of the Official Hearings held on both sides of the Atlantic immediately after the disaster, that the there had in fact been two distress positions sent out by Titanic's Senior Wireless Operator, John (Jack) Phillips. Incredible as it may seem, both of them were wrong! From the same sources, we know that the first one was calculated by Titanic's captain, Captain Edward Smith and that the second, amended one, was calculated by the ship's 4th Officer Joseph Boxhall. When these positions were compared with the actual position of the wreck, it was found that the first of these was 20 nautical miles west of where the ship actually sank. The second was not as far-out. It was a mere 12.6 nautical miles too far to the west. Before proceeding further, it should be borne in mind that a distress position is the position to which all potential rescuers should head-for. To be fit for purpose, it should be calculated with the utmost accuracy. Furthermore, it must indicate the place where the ship finally came to a halt; not, in the case of Titanic, the place where she hit the iceberg. Titanic's Captain and her 4th Officer would have been very much aware of the need for accuracy, so how was it possible for an experienced Extra Master like Captain E.J Smith and his younger, but equally well qualified 4th Officer Joseph Boxhall, to get things so very wrong? One thing is for absolute certain, and that is that Captain Smith at the ripe old age of 62 was anything but a slouch when it came to the art of navigating a ship; any ship. In fact, I am of the opinion that Captain Edward J. Smith did not make a single mistake in his navigation. That is, unless trust in his junior officers can be classed as such. Consequently, in the following pages I will attempt to clear the man's name and show the source of the erroneous distress position contained in Titanic's first cry for help....her first CQD. Titanic historian and author Samuel Halpern has written extensively and imaginatively on this subject. In his last offering "Mistakes in The Night" he concluded that “a simple mental error when comparing the time difference between two events, and then another error when taking a reading from the wrong column of a traverse table “ might have been the root-causes of the two erroneous distress positions." However he qualifies this by adding "Unfortunately, there is no direct proof that Captain Smith was off by an hour when he did his calculation, or that Boxhall misread a traverse table". It is believed that Captain Smith, who was eventually the man in charge of the Titanic when it sank, failed his exams the first time round because he did not have sufficient navigating skills." I agree with the sentiments expressed in the last two sentences of the above paragraph but profoundly disagree with the contents of the first sentence. Speculation is only necessary when there are gaps in knowledge or limitations in the ability to properly interpret what is known for sure. In the case of Titanic, there is more than enough hard evidence. It can be found in the transcripts of the evidence given by Titanic's surviving navigating officers and other crew members. Taken at face value, this evidence can be used to determine where Captain Smith went wrong; if indeed he did go wrong. To speculate simply opens-up the “What if?” option. For sure, that option has its attractions. However it also attracts the lovers of myth and magic. It simply acts on the thinking processes in the same way as does a burr on a donkey's hide. It sticks and tends to obscure the facts. It accentuates the false “Eureka” moment and diverts logical thought. In the case of Titanic it has resulted in the complete binning of whole swathes of important sworn evidence in favour of more attractive scenarios. In the following work, I intend to only use sworn evidence from the mouths of individual survivors. While keeping speculation to an absolute minimum, I will, where possible, avoid extending or embellishing existing evidence to achieve a conclusion. To help me achieve the desired outcome, I will employ bridge practice of 1912. I will also back up all navigation conclusions with completed details of how these conclusions were reached. However, it is not my intention to frighten off non 'Techies', consequently, most detailed calculations are confined to the Appendix to this work. For those who have another life other than Titanic, I will illustrate my points with dreadful, not-to-scale sketches as we go along. So let's get at it. On her way across the ocean to New York, Titanic followed a series of tracks which had been drawn like railway lines on the charts supplied to her Captain by the White Star Line, owners of the ship. By Noon on April 14, 1912, the great ship had completed the better part of her journey from Queenstown in Ireland to New York in America. The following sketch illustrates the intended tracks between Noon and midnight on April 14. If there had been no ice berg and Titanic had been sailing in a vacuum, she would have followed the above plan to the letter and we'd have nothing to write about. However, there was an iceberg and ships don't sail in a vacuum. Additionally, as we have seen already, humans make mistakes. Put these together and we have the recipe for a puzzle. All puzzles are solve-able as long as all, or almost all, the pieces are available. So, in the light of the old saying “Fun's fun but to hell with nonsense”, let's carefully examine all the available evidence and make a serious attempt to bring the pieces of the puzzle together to form a clear picture. The superficial and most dramatic events leading up to the moment when the ship hit the ice berg are almost etched in stone so I will not bore you with these details. It is normal practice for article such as this to end with a summing-up of the main points. In this case, I'm going to work in reverse and start the work with a summary. A sort of “Flash Back” method if you like. There were two false distress position sent out by Titanic. The first was calculated by her Captain and the second by her 4th Officer. The first was 20 miles too far to the west and the second was 12.6 miles too far west. Captain Smith's distress position error was caused by him using an inaccurate 8 pm Dead Reckoning position calculated by his 5th Officer Herbert Lowe. The position he used was 20 miles too far to the west. 3rd Officer Pitman mistakenly assumed that Titanic had over-shot her intended turning position by a margin of 45 minutes at a speed of 21.5 knots. Thus he assumed that the ship was much farther south and west when she did turn. He also assumed that Titanic was right on the track at 7-35 pm. He could only have done this on the basis of a single calculated Latitude crossed with his DR Longitude for 7-35 pm. The end result was a 7-35 pm position 20 miles too far to the west. 5th Officer Lowe's 8 pm DR error was caused by propagating errors already committed by 3rd Officer Pitman by using that officer's erroneous 7-35 pm position as the base for his 8 pm DR calculation. 4th Officer Boxhall made several fundamental errors. He assumed that Titanic was making a speed of 22.0 knots from the time of the true 7-35 pm stellar position until the moment of impact. Like Pitman, Boxhall also assumed that Titanic had overshot her planned turning position. Boxhall knew that before the moment of impact, the ship's clocks had been set back by 24 minutes as part of a planned total of 47 minutes. However, he did not work in ship time but in Greenwich Mean Time. Consequently, when converting ship time of impact to GMT of impact, he inadvertently duplicated the 24 minutes clock change. Thus he used the wrong run time from 7-30 pm sights, the wrong speed and the wrong distance to calculate his distress position. Analysis of the foregoing errors show that contrary to her turning at or overshooting her planned turning point, Titanic turned at a point to the eastward and south of her planned turning point. Contrary to the popular belief that it took 2 hours and 40 minutes for Titanic to sink, she in fact took very close to, if not exactly 2 hours and 25 minutes. Now that I've got that lot off my chest, I'll “flash-back. This is all about events that took place after the ship hit the iceberg so where better to start than that very first distress call? The Marconi land station at Cape Race, Newfoundland. According to Titanic's Junior Wireless Operator Harold Bride who was present at the time, Captain Smith personally ordered the transmitting of the first distress call around Midnight and the first vessel to acknowledge its receipt was the SS Frankfurt. From the Log Book but not from the wireless log of the steam ship Mount Temple, we have proof that her Wireless Operator John Durrant, also heard that first transmission. It was a general message, sir. 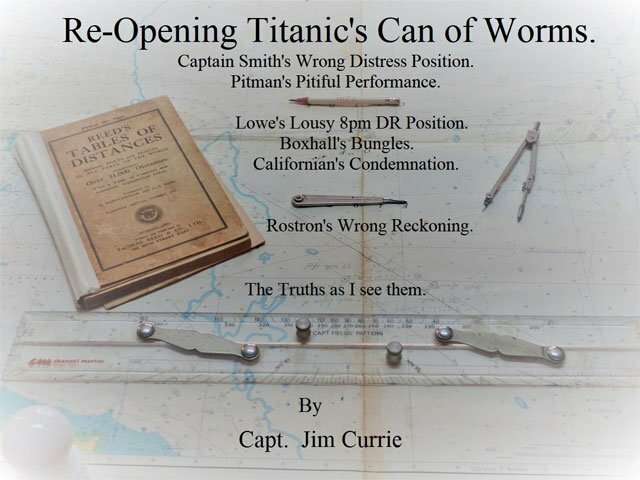 Excepting Captain Moore's isolated revelation and the mention of it in the Final Report of the UK Wreck Commissioner, the transcripts of the witness evidence from the Titanic hearings on both sides of the Atlantic are relatively silent on the matter of that first distress position. As far as I can tell. the world had to wait another 50 years before it received another airing. ¹ Note that his message was not allocated a time of receipt. ² Wireless Logs in that part of the world were kept in Eastern Standard Time for New York. In 1962, to mark the 50th anniversary of the Titanic disaster, her surviving 4th officer, Joe Boxhall gave a BBC radio interview. The following is an accurate copy of a transcript of that part of the interview relative to the first CQD. Boxhall is recalling his conversation with Captain Smith. This is perhaps the best time to acknowledge that those reading this might not be au fait with navigation terms therefore allow me to inform. First of all, in nautical terms, DR stands for “Dead Reckoning” ( position). In simple terms, it means 'lacking a proved, fixed position for the ship, this is our best informed estimates as to where we think she is'. In practice, it should be as accurate an estimate as possible short of establishing an actual position. Now back to Boxhall's BBC interview. In the transcript of the interview, I have deliberately emboldened Boxhall's claim that he told his Captain that the true 8 pm position for Titanic was about20 miles ahead not asternof where the ship's Navigators thought she was at 8 pm that evening. Now this creates a dilemma. If Captain Smith used an 8 pm base position which was 20 miles astern of where the ship really was at that time, then his distress position would have been 20 miles astern of where Titanic finally sank. In fact, it was not...Captain Smith's distress position was almost exactly 20 miles ahead of where Titanic went down. This suggests that if he had used the proper 8 pm DR position in the first place, the resulting distress position to be transmitted would have been exactly where Titanic lay as she was sinking. In my next sketch, I will amend the first sketch to include the factors mentioned in this last paragraph. Many have trashed Boxhall's 20 mile story, describing it variously as the ravings of an old man, vivid imagination, bunkum or even a down-right lie. None of the foregoing is anywhere near the truth. The emboldened bit is mine not Sam's. The answer to Sam's question is “very easily”. On the section of the North Atlantic run Titanic was on at that time, the chart in use would be of no practical use except as a vague guide to progress. Similarly, the plotting on that particular scale of chart of either calculated or DR positions would be a waste of time. For instance, a simple pencil mark made with a sharp pencil would be almost a mile thick. Captain David Brown made an interesting observation in one of his posts in the Encyclopedia-titanica. I hope David will forgive me if I don't quote exactly what he wrote. However, he wrote words to the effect that he was of the opinion that what went on regarding navigation on board Titanic before 5-50 pm April 14, 1912 when she turned onto her final course for New York, was of less importance than what took place after that time. I agree with him almost 100%. This offering of mine proves David's point. However, it will also point out a happening before 5-50 pm which had a very profound bearing on the actual track followed by Titanic. In the following pages, I will attempt to qualify my beliefs. I will use all the available evidence from the transcripts of both public hearings held into the cause of the disaster. I will try my best to keep tech-talk to a minimum and use “landlubber” expressions in place of maritime ones wherever possible. I have already made my conclusions known to you. Now comes the detail. 4 pm to 6 pm: First Dog Watch...4th officer Boxhall, 6th Officer Moody, Helmsman: QM Rowe. 6 pm to 8 pm: Second Dog Watch...3rd Officer Pitman, 5th Officer Lowe, Helmsman: QM Humphreys? I won't bore you dear reader with an explanation for the term “Dog Watch”. Suffice to say, that's the peculiar name given to these times had nothing to do with our 4 legged canine friends who never had a hand (or paw) in the proceedings. In accordance with the duty roster; a few minutes before 6 pm on Sunday, April 14, 3rd Officer Pitman and his Junior, 5th Officer Lowe took over in the wheelhouse and chart-room from the 4th Officer Boxhall and 6th Officer Moody at the start of the Second Dog Watch. At that same time, the three duty Quarter Masters would also be relieved at their respective posts. Helmsman QM Rowe would be relieved at the wheel as well as bridge messenger QM Hichens by his side. QM Olliver as aft standby lookout on the poop would also be relieved. Before he went below, the last named would read the Patent Log and telephone the bridge with the reading for 6 pm. If we are to believe and interpret the following transcript of the evidence of 5th Officer Lowe, the reading at that time was 125.7 nautical miles. - If you take the average speed from 12 to 6 - that is giving her a run of six hours - she will not jump up in two hours, from 12 to 6 o'clock, from that average speed. You have six hours in there to take a mean on. But you had means, had you not, of ascertaining definitely how fast the ship was going? Lowe's immediate boss, 3rd Officer Pitman, had other ideas about speed. Throughout his testimonies on both sides of the Atlantic we discover that he used the speed of 21.5 knots. “Senator SMITH: Can you tell what speed the ship was making at the time of these observations? To summarise: Pitman used a speed of 21.5 knots and his assistant, Lowe used a speed of 21 knots. So let's carry-on and be a fly on a bulkhead on the bridge of Titanic that fateful evening of April 14, 1912. At 6 pm, Pitman and Lowe relieved Boxhall and Moody. A minute or so later, QM Rowe was relieved at the steering wheel. At the times of handover, the conversation would most certainly have included something like the following. I draw from the memories I have of having time and time again done exactly the same thing. Indulge an old sea-dog if you will. Herbert Pitman enters the chart room a few minutes before 6 pm and finds Joe Boxhall hunched over the chart table. Pitman: “Evening Joe! Fantastic weather.! How's she doing? Boxhall adds: “It's all in the night orders but she turned ten minutes ago and we're now steering North 71 West. At almost the same moment, 5th Officer Lowe enters the wheelhouse and finds 6th Officer Moody. Lowe: “Evening Jim lad, what's new? As Lowe is talking, the relief Quartermaster arrives in the wheelhouse to relieve QM Rowe who has been steering the ship since 4 pm. Just at that moment, the telephone on the rear bulkhead of the wheel-house rings. QM Rowe answers. The Quarter Master stationed at the stern is on the other end. Stern QM: Log reading for six o' clock. Stern QM: One, two, five point seven. Rowe notes the number in the QM's Log. Then he leaves the wheel house and goes below. Shortly after, Boxhall and Moody do the same. While all that was going on, 2nd Officer Lightoller takes over as Officer of The Watch from Chief Officer Wilde. In handing over the ship, Wilde informs Lightoller about the ice warnings received up to then. Both agree that since the reported ice was to the north of their intended path, the ice would be long-gone before they arrived near to it's historical position. However, Lightoller does not leave things at that. He makes a guess as to when the ship will be entering the area where the ice was last seen. As a precaution, he decides that at dusk, he will order the lookouts to keep a sharp lookout for small, isolated bits of floating ice...particularly Growlers. The latter were usually small but in many cases, big enough to cause damage to the ship. Since the weather is fine and clear and the conditions are improving all the time, Lightoller enters the Chart Room and tells 3rd Officer Pitman that he intends to obtain a fixed position for the ship and would do so immediately after, he, Lightoller, returned from dinner at about 7-30 pm. He leaves the chart room and heads for the mess room. The foregoing method of navigation requires knowledge of when stellar bodies i.e. Sun, Stars, Planets, Moon are near to being due north or south and to the east or west at a chosen time. Fortunately Pitman would not have had to work these necessary times out each evening. Because at dusk on the fist evening out from Queenstown, six particular stellar objects would have been identified and selected as suitable for the purpose of establishing the ship's position at dusk each evening up until the arrived on the other side of the Atlantic. Since a star reaches the meridian (bearing due north or south) of a place about 4 minutes earlier every day, it made the job of a navigator a little easier in predicting when it would be at or near the local meridian every succeeding evening. Thus, Pitman would have an updated list ready for evening sights before the time of taking them. But how did he calculate the fix positions? I hear you eagerly ask (or don't ask). In previous discourses on this subject, it has been proposed that the Position Line Method would have been used. I don't agree. Perhaps the following will illustrate why I do not do so. Regardless of background, most of us are familiar with the terms “Latitude” and “Longitude” when discussing navigation. However, there may be a lesser-known alternative definition of these terms. One such definition is “position lines”. A Position Line is simply a line upon which, at a certain point along its length, a ship, person or thing is located. In the pursuit of perfection, it often escapes the learned researcher that calculated lines of Latitude and Longitude are also forms of Position Lines. Consequently, the point at where a Calculated position line of Latitude is crossed by a calculated position line of Longitude is called a fixed position. For these reasons, and since the ship was traveling in a near westerly direction, I think that it was more than likely that The Reduction to the Meridian and Meridian Altitude methods would have been used for Latitude and the Longitude by Chronometer method for establishing the Longitude. Using The Pole Star for Latitude also had the added bonus of being able to quickly determine Latitude. 'Nuff tech stuff. Once Lightoller had left to fill his stomach, Pitman would set-to and prepare for Lightoller's return to the bridge and when the fun and games of shooting the stars would begin. “Shoot” was navigator-speak for using a sextant to measure the angle of a stellar body above the horizon. Name of each stellar body.....Blank spaces for Sextant reading and GMT of the reading. Fixed corrections for observer's height of eye. Any known and relevant constants. Besides the work sheet, Pitman would also pre-calculate the approximate sextant angle for each of the stellar bodies selected. This meant that when ready, Lightholler simply had to set his sextant to the appropriate approximate angle then make a final physical adjustment when taking the actual sight. Thus, Pitman would have everything ready for Lightoller when he returned from dinner at 7-30 pm. Sights would be taken and recorded in the minimum time, leaving some time for Pitman to start calculating the ship's position before he went off Watch at 8 pm. However, to begin the calculations, Pitman would need to have an accurate DR position showing where Titanic was at the time the sights were taken. The more accurate this was, the better would be the outcome. This is where it gets interesting. Pitman's first action to determine an accurate DR for sights would be to determine a time for when Titanic turned onto her new course and precisely what that course was. Next, he would need an average speed. Finally, he would have to settle on a precise time for the position yet to be calculated. In all the available evidence concerning this part of the Titanic story, the expression “7-30 pm position” has been used. However this is inaccurate since Lightoller did not return to the bridge until 7-30 pm and it would be some time after that before he took his first stellar observation. As we have seen, Pitman would be ready for him therefore we can safely assume that Lightoller would have completed his series of stellar observations by 7-40 pm. We don't know the time chosen by Pitman for his calculated position but in using 7-35 pm, I don't think I will be too far out. Now I will try and get inside 3rd Officer Pitman's head as he worked out the 7-35 pm DR Position to use with Lightoller's sights. 3: Course from position of the turn. 4: Speed from the turn. You will also remember that Pitman was of the opinion that Titanic should have turned at 5 pm, not 5-50 pm. Why he should have thought so is beside the point. All that matters here is that he thought so and publicly said so. The following sketch illustrates the situation. Pitman's second calculation would be as follows. Pitman's 7-35 pm DR Position for Lightoller's Star Sights. Having established a turn position. Pitman would then run on the new course from 5-45 pm until the chosen sight time of 7-35 pm. Using a speed of 21.5 knots and a course of 265º True from there, he calculated where he thought Titanic would be at 7-35 pm... the DR position where Lightoller would make his sextant observations to obtain a proper position for Titanic. When Lightoller returned from dinner, 3rd Officer Pitman was ready for him. With pencil in hand and sight time sheet in front of him, Pitman would station himself hunched over the chronometer, pencil poised ready to take the times and measurements of the stellar observations. The door to the chart room would be open and hooked back, as would the doors to the wheelhouse. In addition, a couple of wheelhouse windows would also be open. Lightoller would station himself out on the bridge-wing with his trusty sextant in hand and shout “READY!”. At Pitman's affirmative reply, the operation would begin - more than likely with the first sight for Latitude and probably with the old faithful, Polaris the Pole Star. Lightoller would yell “Standby for the Pole Star - ready” Then when he had measured the sextant altitude of that star, he would yell: “TIME” and Pitman would note the time on his sheet. Lightoller would then read-off the measurement from his sextant and yell-out something like “Pole Star! Forty..three..Four-three degrees, four..zero-four minutes and thirty..three-oh..seconds. “Senator SMITH: Do you know how these observations located the ship? The Track he was referring to was one of a number of prescribed tracks that the Captains of all White Star Line vessels were required to follow crossing the Atlantic. Tracks consisted of a number of adjoining course lines pre-drawn on the ship's charts. The track referred to by Pitman, was the final course for new York. The one Titanic had turned onto just before Pitman came on watch at 6 pm that evening. The man's answer to Senator Smith begs the following question. If he did not finish calculating Lightoller's celestial observations, how could he be so sure that the ship was right on the prescribed track? There is but one obvious answer. First., a short course (forgive the pun) concerning Position Lines. 3rd Officer Pitman would work away at Lightollers stellar observation until he was relieved at 8 pm. Meantime, his junior, 5th officer Lowe, would 'tidy' up for the on-coming 8 to Midnight Watch. One of his duties was to calculate an 8 pm DR position for Captain Smith. 5th Officer Lowe's 8 pm DR Position. Average speed and hence distance steamed between positions. Course or courses steered between the initial and DR positions. Initial time GMT: 14d 22hrs 33 minutes. (ship time 7-35 pm). GMT for the 8 pm DR...14d. 22Hrs..58 minutes. Thus run time of 25 minutes . 21 knots (From patent Log reading at 6 pm ). Course to steer: 265º True. As you can see from the frontispiece of this work, 5th Officer Lowe would then have written the result on a scrap of paper, placed the scrap under a paper weight on top of the North Atlantic, Western Sheet chart which would always be open on top of Captain Smith' chart table in The Navigation Room beside his quarters. It would also have been entered into the Scrap Log. About 15 minutes after impact, when he was satisfied that his ship had come to a complete standstill, Captain Smith would first go to the wheelhouse, then to the Officer's Chart Room. In the wheelhouse, he would consult the Quartermaster's log and determine the times of impact and final engine order. Equipped with these times, he would then go to the Officer's Chart Room and consult the Scrap Log which always lay open at the page for the day on top of the chart table. By reason of the approximate time of impact, he knew that the Scrap Log would not have been brought up to date since the impact took place before the changeover of the Watches. This being the case; the only position recorded in the Scrap Log would have been the 8 pm DR position entered there by 5th Officer Lowe at the end of the Second Dog Watch. Questions have been asked as to why Captain Smith did not use the 7-35 pm Fix position related to him earlier by 4th Officer Boxhall. The answer to that is: because at the time he was advised of it, he would simply have pricked-off that position on his Chart with his dividers, made a pencil cross beside it, noted it's position relative to the prescribed Track and perhaps jotted the coordinates in pencil in the margin of the chart. At that time, he had no need for it. Like the chit containing the 8 pm DR position provided by 5th Officer Lowe, it would have been of minimum interest to him. Captain Smith had no reason to doubt the efficiency of his highly qualified Junior officers. He knew that they spent their entire waking hours checking the ship's progress. Working out her exact position and checking the compasses. Because of this, he also knew that under normal circumstances, any minor, accumulated errors would be ironed-out at the time of the numerous fixed position obtained throughout the day. It follows that he would believe that the latest logged DR position would be of sufficient accuracy for the purpose of determining the ship's distress position. Once he had the coordinates for 8 pm and the time of impact, all he then needed to calculate an accurate distress position was a course and speed between the times of 8 pm and the time of impact. For speed, he had two choices, the last recorded Patent Log reading or like Boxhall and Pitman the estimated speed according to engine RPM. We know the patent Log reading at the time of impact was 260 miles. Smith did not. That information was still at the stern with the duty Quarter Master...QM Rowe. We also know from the evidence of Quarter Master Hichens that the last recorded Patent Log reading, taken at 10 pm that evening, indicated a speed of 22.5 knots between 8 pm and 10 pm. It follows that if Captain Smith, like his 3rd Officer Pitman and 4th Officer Boxhall, had used engine RPM for speed. and since the engine s were turning at 75 revolutions per minute, he would likely have used a basic speed of 21.5 knots. However, like 4th Officer Boxhall Smith would have made an allowance for the perfect conditions that prevailed that evening so would have added at least half a knot to the basic speed. This gave him the choice of 22 knots or the Patent Log speed of 22.5 knots to use in his calculation. That leaves us with the times of events Captain Smith used. Note the plural use of the word time. There would have been a recorded time for impact then a recorded time for when the ship finally came to rest. Because of this, Captain Smith would need to make an allowance for the distance westward and southward the ship had traveled between the time of impact and coming to a halt. So what times did the good captain find in the Quartermaster's Log? Getting the Times Right or the Right Times. First, consider the following sworn evidence of John Collins, Assistant First Class Baker. In fact, Collins's clock was 5 minutes fast and showed a time of 11-20 pm at the time of impact with the berg. He made his questioner aware of this. Collins was what was termed a “Day-Worker”. Day Workers did not keep Watches, they worked from early morning to late evening. Consequently, he and his Day Worker crew mates would have fully retarded their personal time pieces before retiring so that when they came on duty the next day, they would do so at the proper time. If the clock belonging to Baker Collins showed 11-15 pm at the time of impact, then. Since the planned set back of clocks was 47 minutes, a partially altered clock would have showed 11-15 pm + 23 minutes = 11-38 pm. The unaltered April 14th time would have been 11-15 pm + 47 minutes = 12-02 am. This begs the question: apart from the clock owned by Collins, did any clocks on Titanic show such unaltered time? Not only was 18 year-old Baker Collins a Day Worker, he was also was what was known in the trade as a “First Tripper”. A new boy if you like. In my experience, the majority of First Trippers were very anxious to keep a low profile and to please those in charge of them. The precise manner in which young Collins gave his evidence and the belief that he was one of an anxious minority incline me toward his account of the time of impact. Therefore from here-on, I will use the time of 2 minutes past Midnight on April 14, 1912 as the moment of impact in my calculations. Captain Smith's Distress Position Calculation. When Captain Smith looked in the Quartermaster's Log, he would discovered a list of times and events starting with the moment of impact and ending with the last engine movement. If I am correct, then the first entry would have been: 12-02: collision with iceberg. This would have been followed by the clock times for a series of engine movements ending with something like: 12-08 am: All Stop... Carpenter sounding-round. At this point, is should be borne in mind that these times would have been entered in retrospect when the first alarm of action was over. It follows that they were not completely accurate. The Captain would copy the pertinent times onto a scrap of paper and move on into the Officer's Chart Room. Once there, he would look in the Scrap Log for any further information. Immediately, he would see that the end of the 8 to 12 Watch entries had yet to me made. However there would be two pieces of information of use to him. These would be the 8 pm DR Position entered by 5th Officer Lowe before he went off Watch at 8 pm and the 10 pm Patent log readings for 8 pm and 10 pm, copied from the Quarter Master's book by 6th Officer Moody. The latter suggested that Titanic had made a record speed of 22.5 knots. My guess is that he would ponder about the prevailing conditions over the previous 4 hours. He would also remember that with her engines turning at 75 rpm and with less than perfect conditions before Noon that day, Titanic had averaged 22 knots. Thus, he decided to use a speed of 22.5 knots as indicated by the Patent Log readings. DR: 8 – 00 pm. Arguments: Lapsed time: 4hrs- 02 minutes Speed 22.5 knots. - Dist: 90..75 miles to time of impact. Course. 265ºTrue. D. Lat : 7.8'South, D. Long: 2º 01.0' West. Smith's Impact position: 41º-46.1'North,................. … 50º-24.4'West. Smith Allowance: 2.0'South.............. ........... ..0.0'West. Smith's Distress position. 41º-44.1'North................ ... 50º- 24.4'West. I know that the result shown above do not match perfectly with the position sent out by wireless. However, my best guess is that once he had calculated his distress position , Captain Smith would adjust the position to even numbers for ease of transmission and jot 41º-24'North, 50º- 24West. on a chit of paper and take it to the wireless room. We can verify Captain Smith's work very easily if we run back on the reciprocal of the the course - 086 True - for a distance of 20 miles. By doing so, the position arrived at should be at or near the wreck site. Smith's Distress position: 41º-44'North,................. ...50º- 24'West. Smith's corrected position: 41º-45.4'North.....................49º -57 West. Titanic Wreck Site: 41º- 44'North......................49º - 57.0'North. Is any more verification of the 20 mile error needed? So you see my friends, there is no huge mystery concerning the method by which Captain Smith arrived at his distress position – the distress position first broadcast to the world by Titanic's chief Wireless Operator, Jack Phillips. His methods were faultless. If he made any mistake at all, it was that he trusted his Navigators to provide him with a constantly updated, accurate historical account of his ship's progress. I have been urged to prove where Boxhall's 20 mile error came from. I am of the opinion that his little exercise of mine does just that. (b) His conviction that Titanic ran past her planned turning point for 45 minutes at a speed of 21.5 knots. The mistakes of Pitman were aggravated by the actions of his Junior, 5th Officer Lowe in accepting without question, his boss's position for the 7-35 pm sights and using that position and the wrong speed to calculate the 8 mp DR position. What surprises me most of all, is that 3rd Officer Pitman and his colleague, 4th Officer Boxhall and almost 99% of Titanic historians were and still are guilty of making exactly the same mistake. They assumed that since from Noon, April 14, Titanic was 'aimed' at the turning point named by seafarers The Corner, she actually arrived at that very point and even passed through it. There is an excuse for those who have never squeezed salt water out of their sea-boot socks- or even owned sea-boots. However there was absolutely no excuse for that truly dreadful, short-sighted mistake made by men who should have known better. Because they all knew perfectly well that unless an accurate position for Titanic had been ascertained just before 5-50 pm that evening, there was no guarantee that the course she had followed from Noon that day was the course planned by her Captain. There was no guarantee that her progress had not been influenced by external factors including wind, currents or last but not least, bad steering. In fact, the foregoing work and the evidence of 5th Officer Herbert Lowe points to some such phenomenon actually occurring during that Sunday afternoon. It shows that Titanic most certainly slowed down immediately after Noon April 14 and did not increase speed until 7-30 pm. It also shows that by 8 pm that early evening, she had attained her optimum speed for the engine revolutions she was carrying and made that speed until the moment she hit the iceberg. The 20 mile error of Captain Smith connected us with 4th Officer Joseph Boxhall. Since we have been able to establish a proper time scale for the accident, let's have a look at his mistakes based on what we have learned so far. To date, there have been numerous ingenious ideas as to how Boxhall got his distress position so wrong and the above extract of his evidence proves he was no slouch when it came to uncertainty. The main obstacles to discovering his thought processes have been: (A) we had no coordinates for the “7-30 pm” position and (B): we had no idea of the number of hours and minutes Boxhall used in combination with his estimated speed of 22 knots. Perhaps in finding answers to the Captain Smith problem we have unearthed the missing parts of the puzzle? Let's see if I'm right. As I said, we needed coordinates for the position found by stellar observations just after 7-30 pm that evening of April, 14. My work on the Captain Smith problem has, as you have seen, produce such a position for the chosen time of 7-35 pm. I remind you: 41º-56.4'North., 47º-46.6'West. ( see appendix Calculation No. 8). If this position is close to the actual position used by Boxhall, then by finding the distance from there to his declared distress position and dividing that distance by 22 knots we will obtain the number of hours and minutes...lapsed time he used between the 7-35 pm Fix position and Boxhall's chosen time for the accident. (A). 4 hours 11 minutes (B). 4 hours 35 minutes or (C). 4 hours, 58 minutes. The first is the time between 7-35 pm sights and his 11-46 chosen time of accident. The second allows for a 24 minutes partial set back of the clocks before the time of the accident. The third allows for the full planned set back of 47 minutes before the time of the accident. The previous results from the work on the Captain Smith problem points to a run time of 4 hours 48 minutes. This is because the difference in Longitude between Boxhall's distress position and the Longitude of the position found for 7-35 pm sights is 147.4 minutes of arc. Since at a speed of 22 knots on a course of 265ºTrue in latitude 42º North, a vessel will change her longitude by 29.5minutes every hour; if we divide 147.4 by 29.5, we find that it would have taken that vessel exactly 4 hours 57 minutes. I propose that this is near enough proof of the run-time used by Boxhall when working his distress position. How did that come about? Well, it seems to me that when Boxhall was establishing a run time to use in the working-out of his distress position, he either inadvertently used the full clock set-back or allowed twice for the same partial set back back. The difference is 1 minute of time so matters little. Logical thought processes would be in short supply given the drama enfolding all round him. The simplest scenario would have been that he guessed that the first 24 minutes of the planned 47 minute clock set-back had already been made before the accident. Then he remembered that he had called Pitman before Midnight when the latter was due on Watch. He then wrongly assumed that as normal, the final 23 minutes adjustment to the clocks had been made by Pitman when he went on Watch. That being so, his calculation to determine a distress position might have looked like the following. Incidentally, keep in mind that Navigators worked in Greenwich Mean Time, not apparent time on the ship's clocks. Accident: 11-46 pm convert to GMT: 15d 03hrs. 08 min. (11-46 + 24 minutes). add 23 minutes midnight set back: 23 min. GMT Accident: 15d 03hrs. 31 min. GMT 7-30 pm sights: 14d 22hrs. 33 min. Run time Sights to accident. 4hrs.58 min. Distance = run time x 22 knots = 109.3 miles. Course made Good: 265ºTrue. By Traverse Tables, this gives: Diff. Latitude: 7.6' South, Departure: 108.6. Diff. Longitude: 2º 27' West. Position at 7-35 pm Latitude: 41º-56.4'North. Longitude: 47º-46.6'West. Diff. Lat. 9.5'South. Diff. Long: 2º-26.2.'West. Impact Position: Latitude: 41º-46.9'North. Longitude: 50º- 13.8'West. Post impact allowance: 0.5'South. 0.5'West. Distress Position: Latitude: 41º-46.4'North. Longitude: 50º- 14.3'West. Boxhall would have rounded-up or down his results for ease of transmission by Morse code. The foregoing doesn't not only illustrate where Boxhall went wrong, but it reinforces the belief that the clocks of Titanic were retarded 24 minutes before impact with the iceberg. This being the case. Since Titanic's clocks were 2 hours 2 minutes FAST of New York EST at Noon on April 14, they were, at the time of impact, 1 hour 38 minutes FAST of New York EST. not the 1 hour 33 minutes claimed by Boxhall. Proof of a Clock Change. The arguments bouncing back and forward concerning clock alterations have gone on for far too long. Yet the answer to the conundrum has lain in plain sight for everyone to see since the day the transcripts of survivors evidence became public. In fact, it was there before the Final Reports submitted by Lord Mersey and Senator Alden Smith were completed. Earlier, I mentioned the time evidence given by the young Day Worker, Assistant Baker, John Collins. I remind you that he had the fully altered time of 11-15 pm April 14 for when the impact occurred. “13302. Can you remember at all what time it was when your boat left? Difference: 2 hours 25 minutes. How does the foregoing fit-in with the previous evidence about Boxhall? Captain Rostron of the Carpathia reported the time of sinking as “2-20 am 5-47 am GMT” on the morning of April 15, 1912. Where did he get that number? 3rd Officer Pitman would provide the time of 2-20pm, However the only officer who had any idea of the GMT of any happenings would have been Boxhall. We have seen above that the fully altered time of impact was at 14d. 23 hours 15 minutes. If impact took place at or near unaltered time then it took place at 2 minutes after midnight April 14. (23 hours 15 minutes + 47 minutes). However, since Titanic's clocks were 2 hour 58 minutes SLOW of GMT at that moment, then impact must have happened at exactly 3 am GMT, April 15. If the ship was afloat for 2 hours and 25 minutes, then the true time of sinking was in fact 3am GMT + 2 hrs and 25 minutes = 5-23 am GMT on the morning of April, 15. The difference between that time and the GMT of 5-47 am used by Captain Rostron is exactly 24 minutes. It follows that Boxhall was using a GMT which was 24 minutes too much. I'm sure you have seen very many version of the argument about whether or not the ship's clocks were altered before the accident took place. I'm equally sure many of you have asked the question “So what?”. The answer is simple. Since the clocks were set back by 24 minutes before impact, then all the theories based on things happening at a given ship time have to be re-thought. Here's a simple example. At 11-10 past eleven (9-20 pm New York EST), 50 minutes after his ship had stopped for Ice, the 3rd Officer of the SS Californian saw a vessel approaching from almost due south. Thirty minutes later, at 11-40 pm(9-50 pm New York EST), that vessel stopped 6 miles away to the southward. That vessel and another one that stopped before it 5 miles to the southeast of the Californian 10 minutes earlier at 11-30 pm (9-40 pm New York EST), could never have been Titanic. Because Titanic did not finally stop until 12 minutes later at 10-02 pm New York EST. Not only that, but when Californian's Officer saw Titanic's first rocket at 12-45, it was 10-55 pm at New York and 12-33 am on board Titanic. That was 8 minutes after Titanic's Quarter Masters Rowe and Bright brought the detonators for the distress signals from where they were stored in a locker on Titanic's poop deck. Since I mentioned the SS Californian. I may as well be hanged for a sheep as a lamb. So here are a few points to consider when you next read the nonsense written abut that vessel and her falsely accused master, Captain Stanley Lord. The accusations against those on that ship are that she was stopped in sight of the sinking Titanic, that her officers saw her distress signals and sat back and did nothing. In fact, only one of the above accusations is true but with qualifications which I don't propose to go into in these pages. Rather, I will simply provide irrevocable proof that Californian was stopped in a position which was 22.5 miles north east of the sinking Titanic. I will also show that while Titanic was sinking, there were at least 3 other vessel nearer than Californian was to the stricken vessel. The Nonsense Written About the SS Californian. A great deal of scholarly nonsense has been written about the connection between the SS Californian and the RMS Titanic while the latter was sinking. Sadly much of it has been written by those who should have known better. This part of the article is designed to layout the facts. It will not speculate or guess at anything. All “facts” are easily proved by carefully reading the transcripts of the evidence given under oath in America and at London a month later. SS Californian before midnight, April 12, 1912. Then I will show that there was indeed a third vessel which was th e real villain of the piece. At 11-10 pm, Californian's 3rd Officer Groves saw a ship bearing about South. He guessed he was seeing it at extreme range of between 10 to 12 miles. That ship approached Californian for 30 minutes on a diagonal course which did not alter very much. Therefore, the ship in question was on n approximate course of North, northeast. At 11-40 pm the ship in ques stopped when about 6 miles away from the Californian. That being the case, then the ship in question was making about 12 knots. Titanic was making 22.5 knots. That vessel's bearing was altering from right to left. There was yet another vessel in the area. It was much closer to the sinking ship and was clearly seen from the bridge of the RMS Titanic. The evidence of 4th Officer Boxhall relative to that vessel clearly indicated a vessel which was underway from the moment seen and approached the sinking ship before it turned its stern toward the onlookers and finally disappeared. That vessel could never have been the SS Californian. The reasons are as follows. The SS Californian was stopped but swinging round throughout the time Titanic was sinking. She never used her engines or changed her position during the entire period from when Titanic hit the ice berg until 3 hours after Titanic slid beneath the surface of the ocean. The vessel seen from the Titanic turned away and showed the observers a single white stern light. Whereas, the Californian never did show her white stern light to any vessel after 11-30 pm. that night. Especially not to the vessel in the direction of which the 8 white rockets were seen. That vessel was stopped to the SE of the SS Californian and was constantly changing her bearing relative to Californian's bow. It changed from the right hand on Californian's starboard beam, round to the left. The first white signal was seen when points on Californian's starboard bow and the last one was seen when 2 points, 22½º on Californian's port bow. This means that when the first signal was seen, observers on the vessel in question would first have seen Californian's green starboard side-light and her two white masthead lights. Just before the last signal was seen from Californian, those on the nearby vessel would first have seen her red and green side lights and both white masthead lights. I left the best bit for the end; the bit that proves that captain Lord's stopped position was indeed at least 22.5 miles to the north and west of the sinking Titanic. At 3-20 pm those on Watch on the upper bridge of the Californian observed two or three white flashes to the southward. These were so low that they were almost right on the horizon. At about the same time, The RMS Carpathia was firing white rockets of “comfort” for those on the Titanic. At that time, Captain Rostron did not know that Titanic had sunk. This item of intelligence is of utmost importance. If the rockets fired by Carpathia were standard distress rockets then when fired, they would rise to about 600 feet above sea level. We know from Captain Lord that his bridge was 45 feet above sea level. This means that his upper bridge would be about 55 feet above the sea. If we add 5 feet, we can safely assume that the average height of eye of someone on Californian's upper bridge would have been 60 feet. This being so, then if Carpathia's rocket had been seen at extreme range they would appear as a flash-loom right on the horizon. And the observer would be 37.1 nautical miles away from the source of the signal. i.e. 37.1 miles separated Californian from the Carpathia. More to the point, the sighting would have been a flash without light. 8010. What do you mean by a very great distance? A: - Such a distance that if it had been much further I should have seen no light at all, merely a faint flash. Last but not least: If it were possible to see Carpathia's rockets at the extreme range of 37.1 miles but clearly see at 33.1 miles, then Titanic's signals were being seen at a radius of at the very least 33 miles and probably at a much greater range, given the conditions that morning. © Copyright Capt. Jim Currie – Island of Madeira – August, 2017. By Traverse Table: D. Lat. 7.9' S. Dep. 13.9 D.Long. 18.7' W.
DR turn position. 41º 52.1'N. 47º 18.7'W. Run: 1hr-50 minutes. Speed: 21.5 knots. Distance: 39.4 miles Course: S 85 W. True. By Traverse Table: D. Lat: 3.4' S. Dep: 39.3 D. Long. 52.9' W.
No. 4: Pitman's 4th Calculation... 7-35 pm Fix position using calculated Latitude & DR Longitude. Latitude by Polaris: 41º 55.5'North. Longitude by DR: 48º. 11.6' West. By Traverse: Diff. Lat = 0.8'S Dep.= 8.8 Diff. Long.= 11.8'W. Departure = 89.7'. On 265 True this is equal to a distance of 90 miles.. At 22.5 knots this would take 4 hours. No. 7: True 8 pm DR Position. No.8: True DR Position for 7-35 pm. True 8 pm DR position: 41º-56.4'North., 47º-56.6'West. True 7-35 pm DR position: 41º-57.2'North. 47º-44.6'West.